Rain at last! Monday morning the sky is grumbling with thunder, even as the sun shines. A sprinkle of rain will wash the pavement covered with mud from the overflowing polluted bayou waters, dried mud that billows in thick choking clouds when cars and buses drive down the streets. A light, sparkling rain will wash the leaves and plants and sidewalks in our yards and parks. The sky had been quiet for so long, empty for a while even of the roaring of low-flying planes. But later in the afternoon the sky turns somber. The rain grows heavier. And now we all feel the nervousness of those who have been flooded and watch the sky with anxiety. We who have grown up with mighty thunderstorms, fearlessly playing in the rain, splashing through flooded streets. Now we are all afraid of what the rain might bring. It’s been nearly three weeks without rain since the historic deluge of Harvey sent flood waters and rain runoff through sewage treatment plants, sewage pumping stations, sewer lines, chemical storage facilities, service stations, toxic waste sites, half a million vehicles (not including smaller machinery), homes, offices, parking lots, shopping malls, and more. The absence of rain was a blessing. We could dry out and recover. 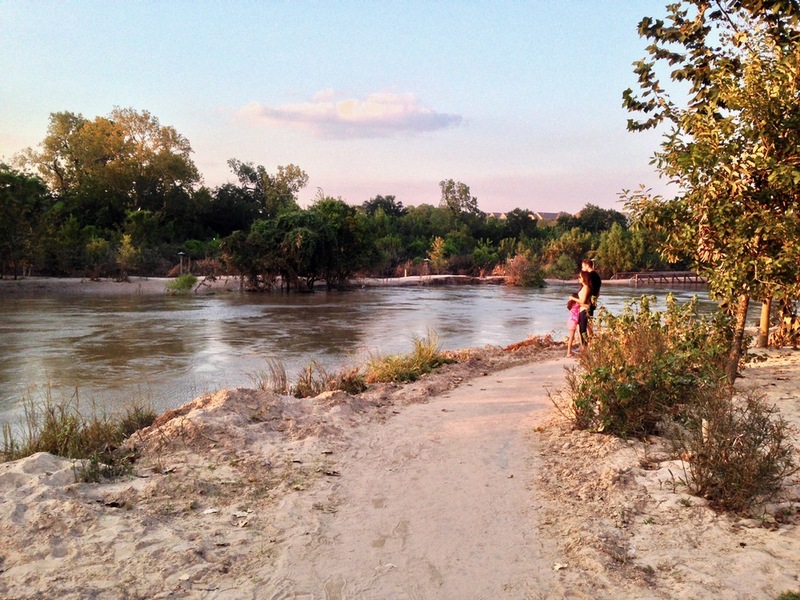 The beleaguered Corps of Engineers could attempt to empty the reservoirs on Addicks and Barker dams in west Houston on Buffalo Bayou upstream. For the first time ever the engineers had been forced to open the floodgates of the seventy-year-old dams during a heavy storm. They knew that they would flood people downstream, that the already flooding river would rise even higher. But the water was rising quickly behind the earthen dams and would soon be flowing over the low spillways at the ends for the first time. At least two people died in their homes on Buffalo Bayou; a third in the basement ceiling of a luxury hotel on the banks near Woodway. We don’t really know what the peak high flow was in the bayou during the storm. The gauges were overwhelmed. Maybe 15,000-16,000 cfs on around Aug. 31. Maybe more. (For comparison, the flow in the West Fork of the San Jacinto River was a record 80,000 cfs when authorities there opened the dam on Lake Conroe Aug. 28.) Since the rains stopped on Aug. 30, the flow in the bayou has been dropping slowly by several hundred to nearly a thousand cubic feet per second a day. (On Tuesday morning the floodgates were closed, and the flow had dropped to below 1,000 cfs. Base flow with no rain is about 150 cfs.) But on Monday evening the floodgates on the dams were still open, and the water was still draining. And there was still some 36 billion gallons of storm water remaining in the reservoirs, down from about 129 billion at their apparent peak on Aug. 29. 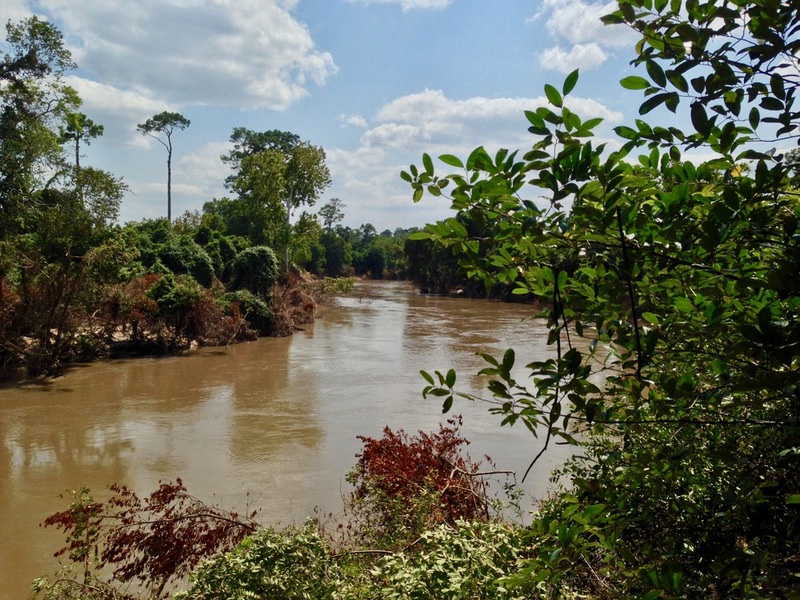 The two reservoirs are normally dry parks with flowing streams (including Buffalo Bayou), filled with trees, trails, and recreational facilities now covered with sediment. A spokesman for the Corps, citing pending lawsuits, declined to comment Tuesday afternoon on the unusual shutting of the floodgates while storm water remained in the reservoirs. We have been waiting for the waters to recede, to see what was revealed, the changes wrought to the banks. A flood in a natural setting is an awesome thing. We do not mourn the process of nature. But a flood where people live and work is tragic. Not since the Enron scandal in 2001 has Houston faced such a deluge of criticism and bad publicity. Abundant praise, yes, for the generous and courageous response of neighbors helping neighbors and strangers. But according to our critics, flaws in the civic character—greed, incompetence, short-term thinking, a disrespect for nature—created an urban landscape that allowed maybe the worst storm ever to hit a metropolitan area to become a catastrophic flood, damaging or destroying some 136,000 homes, businesses, and other structures, maybe a half a million cars and trucks, taking fifty lives, damaging and disrupting the lives of many thousands more. Here are links to some of the more thoughtful and informative articles published. Debo advocates that urban design mimic rural hydrology as much as possible. Reducing impervious surface and improving water conveyance has a role to play, but the most important step in sparing cities from flooding is to reduce the velocity of water when it is channelized, so that it doesn’t deluge other sites. And then to stop moving water away from buildings and structures entirely, and to start finding new uses for it in place. Looking upstream from a high bank in Memorial Park on Sept. 11, 2017, at around 2:30 p.m. Flow was still about 7,000 cubic feet per second. Updated Sept. 6, 2017, with a new tool from the Corps of Engineers for projecting inundation levels on Buffalo Bayou going forward. Update Sept. 14, 2017: The Harris County Flood Control District has reported that at least eighteen gauges were damaged by extreme high waters from Harvey. As of Sept. 11, the district had repaired twelve of them. 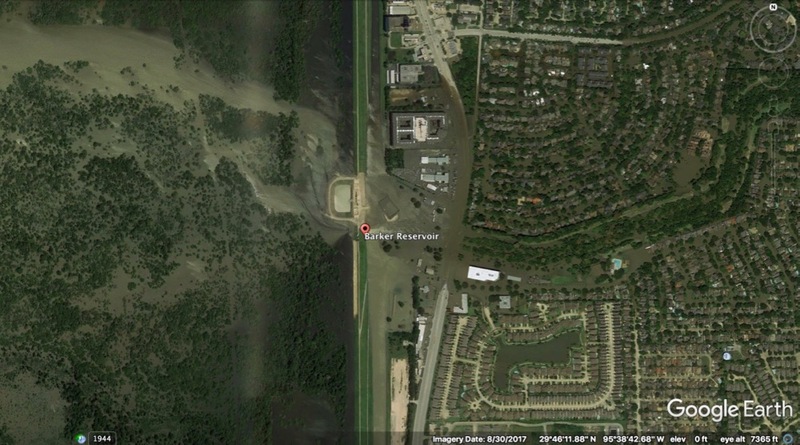 The Corps of Engineers also reported that the US Geological Survey gauge on Buffalo Bayou at Piney Point was temporarily knocked out of commission by high waters. As of this writing a great many people living along Buffalo Bayou have been forced out of their homes by the flooding river. On Friday, Sept. 1, those who remained in their flooded homes below Addicks and Barker dams in west Houston were asked to leave by the mayor, a request that became mandatory the next day. Offices, apartments, hotels, parking lots, parks, country clubs, and sewage treatment plants built next to the bayou also have been flooded. Many people were taken by surprise, it seems. Knowing when and how fast the bayou was rising might have helped more people prepare. Knowing when the waters might recede might also help people plan. Here is how people living and working along Buffalo Bayou below Addicks and Barker dams can receive real time alerts about a dangerous rise in the flow of the bayou. This is for the gauge at Piney Point, which is the gauge the Corps of Engineers uses to monitor the flow in the bayou and regulate storm water releases from the reservoirs behind those two federal dams in west Houston. And here is a link to the interactive inundation map, just released to the public by the Corps of Engineers, that can help people see when and where the bayou might go down.